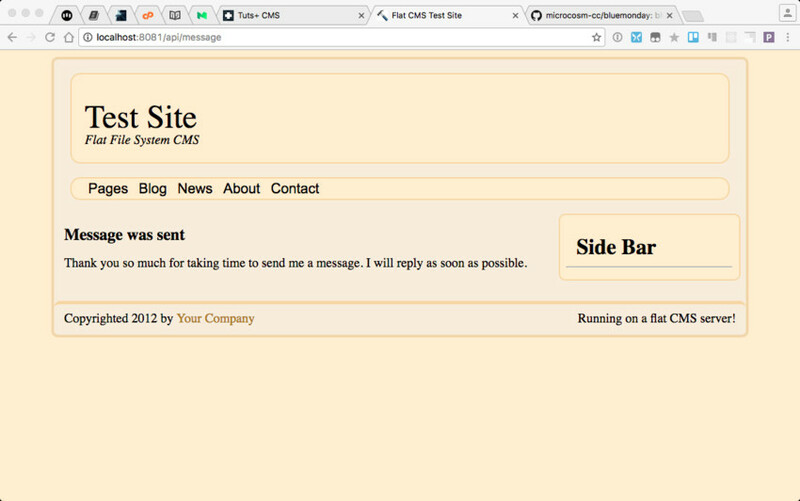 This tutorial is about adding an email message system to your new PressCMS (i.e. phpPress, rubyPress, nodePress, and goPress). I am starting with the front-end and then addressing the back-end for each system. I am assuming you already have these servers on your system. Since the front-end code will be the same for each server, you will have to copy these new files to each of the server directories. Therefore, I will talk about the files in the path as referenced from the server directory. This creates a basic form asking for a full name (first and last name), email, and a message. This form uses regular expressions to ensure that the name and email address are valid. If whatever the user inputs into those fields does not match the regular expression in the pattern directive, then the form will not be submitted. A popup will ask the user to properly fill in the field with the message in the title parameter. Each input field has the required primitive as well. This keeps blank forms from being submitted. This is the bare minimum data validation you should use on the front-end. The action directive in the form element tells the web browser what address to submit the form data to. The method directive tells the browser to send as a post method. The form data will be placed into the URL of the post request to the server. This is a Query String. The server then processes the information in the query string. This is a simple contact form. Please fill in your name, first and last, email address, and message. I will get back to you as soon as possible. Thanks. Once saved, you can try out the pages in the server. In your browser, open the page http://localhost:8081/contact. The Contact Us page will look like the above picture. Notice the highlighting of the Name field directly upon loading. The autofocus directive creates this desired behavior. It is always good design to have the first field the user needs to type into focused automatically. Thank you so much for taking time to send me a message. I will reply as soon as possible. Just a simple message so that the user knows the message was properly sent. You can expand upon this as you like. This will make the library available for your program. That is the only non-standard library needed. // Setup special route for our form processing. to := "<your email address>"
subject := "Message from User:" + name + " of CustomCT.com"
pgloc := goPress.SiteData.Sitebase + "pages/messagesent"
These two functions make up the handler for processing emails sent from the browser. The /api/message route calls the postMessage() function. It retrieves the information sent from the form filled in by the user, sanitizes the message with the BlueMonday library, and sends an email to the owner of the site using the sendEmail() function. You will have to put your Gmail address in place of the <your email address> holder and the password in the <password> holder. This function is exactly like the SetGetRoute() function. The only difference is using the web.Post() function. With these changes, your goPress server can now send your emails from the user. This will load the nodemailer library and set up the reusable component for sending emails. You have to replace <your email name> with the name of your email address (i.e. before the @ symbol), <your email domain> is the domain for your email address (i.e. gmail.com for normal gmail or your domain name if you have gmail set up on your domain name), and <your password> with the password for your email account. // Configure the body parser library. // Send the user to the message was sent okay page. This is the handler for the /api/message address. This function gets the information sent from the form, creates the proper email message, and sends it to the email address given in <your email address>. After sending the email, it will send the user to the /messagesent page. The body parser middleware has the url parameters saved into the request.body variable and properly sanitized. This code works for Gmail setup without two-factor authentication. If you have two-factor authentication, you can refer to the Nodemailer documentation to set it up. # Get the parameters from the form. # Create and send the email. # Send the user to the message sent page. With these additions, your rubyPress server can process email forms. Once you change <your email address> to your email address and <your password> to the password for your email server, the script is finished. // Get the page contents. // First pass on Handlebars. // email form on the website. // Get the post variables. // Create the email message and send it. This is a post request handler for the /api/message path. It retrieves the form data sent from the browser, creates an email with it, and sends the email. PHP automatically takes any URL parameters and places them in the global array $_POST. You will have to replace <your email address>, <your password>, and <your name> with the appropriate values for your email. If you are using something other than a Gmail SMTP server, you will need to change the $mail->Host address as well. 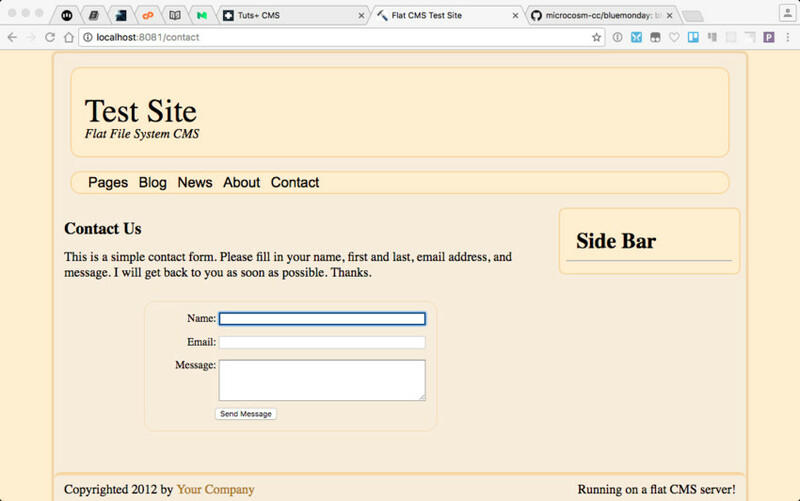 I have shown you how to easily add an email form to a pressCMS site. The download for this tutorial has all of these servers with their modifications. You can therefore download it instead of typing. I’ve done a little error handling. I’ll leave the rest up to you as an exercise. The method I taught here is by posting form data with the data in the URL. Many sites nowadays use a REST API with the data in a JSON string in the body to perform the action. These routines are easily adopted to that methodology, but that is an exercise for you (or maybe a future tutorial). Now that you know how to do it this way, add your own forms to your site. This type of customizing is a lot of fun. The only limit is your imagination.